It’s hard to keep track of everything you experience and achieve while you’re in college. Sure, your grades are on your transcript, but that doesn’t tell the whole story. 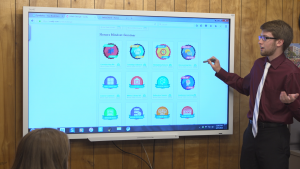 Students in Illinois State University’s Honors Program now have a better way of tracking and showing off their accomplishments, using new digital badges. Students can earn 110 different badges—with more to come—representing their Honors experiences, such as conducting research, traveling abroad, or completing the Honors Mindset Seminar course. Students add their verified badges to their profile on Credly, which provides the badging platform, and can later share them on LinkedIn and other social media channels. A student looking for an internship, job, or admission to graduate school can show off their badges—just like a digital portfolio. Honors student Jackie Durnil shows off her digital badges. The Honors Program promotes exceptional learning for exceptional learners, powered by six unique learning experiences such as Honors Travel and Honors Explorations. Those experiences, plus five related Dimensions of Honors Learning, were central to a recent overhaul of the Honors program. 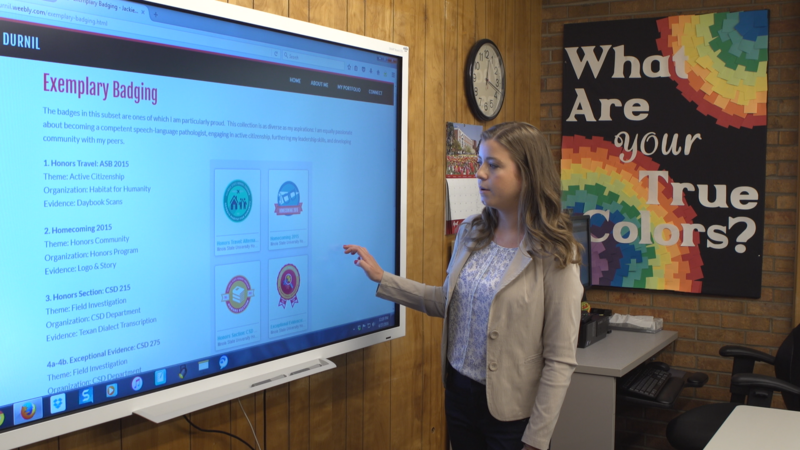 Students pursue learning in compelling and innovative ways—in and out of the classroom—and the new digital badges recognize and verify these achievements, as well as participation in co-curricular and Honors community events. Since launching for new Honors students in fall 2015, more than 7,000 badges have been earned, with 3,000 more soon to be issued from the spring 2016 semester. Related Article: Partners with Credly How Illinois State re-imagined its Honors Program using digital credentials. Mitch Stengel, sophomore communication studies teacher education major, has already earned 29 badges, including several highlighting his experiences on a life-changing volunteer service trip over spring break. His individual badges link to evidence showing how he earned each one. Honors student Mitch Stengel, sophomore communication studies teacher education major, has already earned 29 badges. Each badge has its own distinct look, designed by the Honors Program and University Marketing and Communications. The overall program is a partnership between Honors and Credly. Badges issued and stored on Credly can be taken with students after they graduate, and connect with platforms where students can find new opportunities, like LinkedIn, graduate admissions and employer talent management systems. Jonathan Finkelstein, founder and CEO of Credly, visited Illinois State in March and helped introduce badges at the 2nd annual Honors Professional Development Night. “Throughout their time on campus, Illinois State’s Honors students demonstrate the valuable skills, mindsets, and abilities that employers and graduate programs seek out,” said Finkelstein. “Illinois State’s innovative badge initiative is helping students surface verified evidence of achievement and tell a story about their capabilities in a way that an academic transcript alone cannot. “We’re honored to partner with Illinois State on offering a student service that is fast becoming a national model for the power of digital credentials to communicate the true value of the college experience,” he added. Learn more about digital badging and the Honors Program.